When the days are darker and the world is frightening, it’s nice to know that twinkly lights, cold pink noses, and a warm mug of mulled wine still feel a lot like magic. 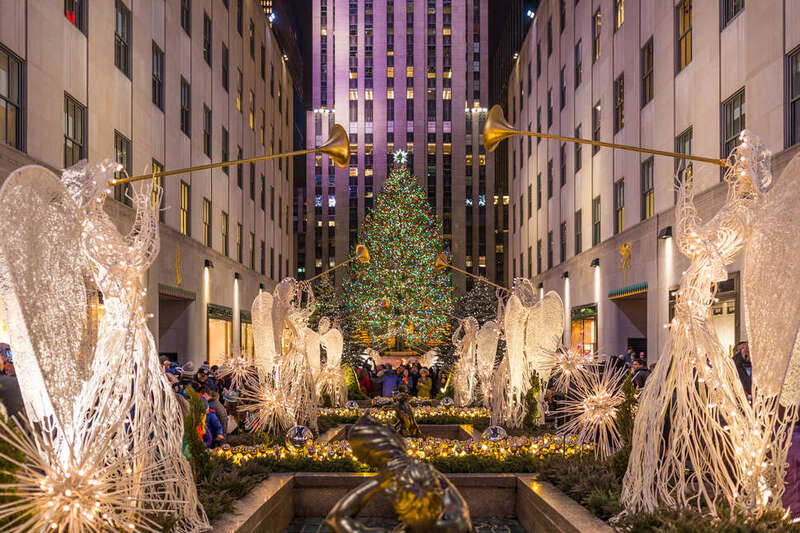 New York City, of course, has all the branded holiday classics -- Macy’s Santa, the Radio City Rockettes, the Times Square Ball -- but it is possible to separate your celebrating from unfettered free market capitalism. 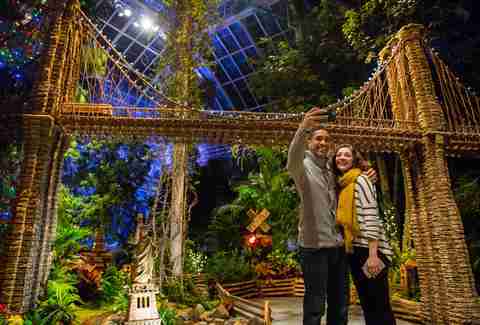 The city has a whole season’s worth of things to see and do and celebrate. So skip 34th Street and try something new -- you never know what might become your next tradition. It turns out you don’t have to be visited by the Ghost of Christmas Past to be a good person. This holiday season, volunteer with City Meals on Wheels and hand-deliver holiday meals to NYC’s homebound elderly population. A few hours out of your day will mean the world to the people you visit. Believe it or not, that feels even better than getting exactly what you wanted off your Amazon Wishlist. 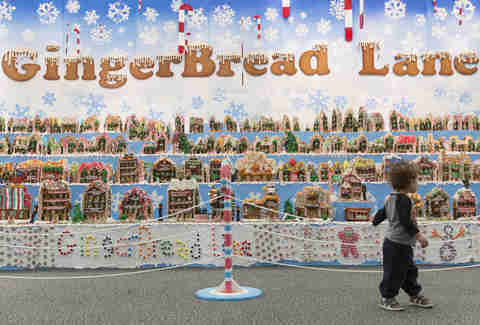 It takes a whole year for chef Jon Lovitch to create the Guinness World Record winning Gingerbread Lane on display at the New York Hall of Science. The confectionary city is made up of hundreds of pounds of gingerbread, icing, candy, and gum, and, since it sits around for so long, probably isn’t a suitable snack. If you’ve only ever scoffed from the crimson colored periphery of these pop-up labyrinthine markets, it’s time to peek inside. 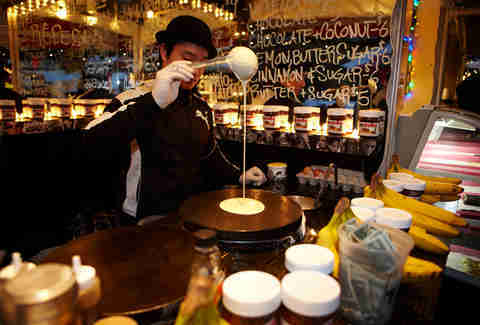 Even the Grinchiest New Yorker’s heart will grow in the glow of vendors hawking their wares in Union Square, Bryant Park, and Columbus Circle. Sure, the open-air markets are cold, more expensive than online, and packed with about 90% tourists, but I don’t have a way to finish this sentence. Every day at 4:30, the Metropolitan Museum of Art lights its spectacular 20-foot blue spruce. It’s about three-fourths shorter than the Rockefeller tree, but it’s, like, 10 times classier. A baroque crèche -- featuring not only an authentic Neapolitan Nativity, but scenes from a Mediterranean harbor town -- is set in front of an 18th-century choir screen from a Spanish cathedral. On Fridays and Saturdays, the Met hosts additional tree-lighting ceremonies at 5:30 and 6:30pm. Chanukah comes right on the heels of Thanksgiving this year, so get your dreidels ready. Union Hall hosts this comedy night led by a few of New York’s funniest Jewish comedians (stiff competition!) that doubles as a fundraiser for the Squirrel Hill JCC and the Center for Advancing Holocaust Survivor Care. Kick off eight nights of family, guilt, and eating too much with jokes, singing, and -- of course -- food. 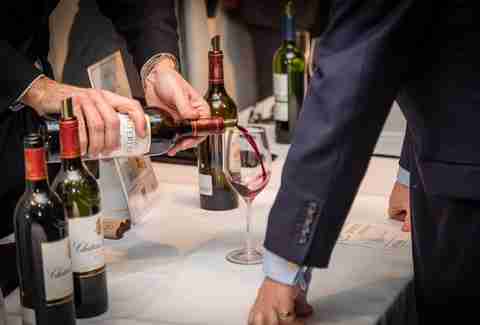 Skip the bodega six pack and taste from bottles Sotheby’s Wine has selected just for the holiday season, instead. Whether you need Champagne for your New Year’s Eve party, a goes-down-easy Riesling to make it through Christmas with your family, or a gift for your assistant, they’ll help you find the perfect bottle. If you’re feeling stretched a little thin this year, you can get tipsy and do all of your holiday shopping in one fell swoop. Now in its 10th year, the Latke Festival is a city-wide competition to see who can fry up the best potato pancake. With submissions from Veselka, Shelsky’s Delicatessen, Baoburg, and Mike’s Hot Honey (among tons of others), a ticket lets you taste your way through all of the imaginative entries. Think less “kosher” and more “kimchi,” although I bet you’ll be able to find a latke almost as good as your Bubbe’s. Food 52 hosts The Art of Chill Holidays to help you learn the art of easy entertaining. While there’s no way to make it through the holidays without getting stressed, being prepared with tricks, tips, and simple cocktail recipes makes hosting dinner for your future in-laws seem a little less daunting. You don’t have to cook a perfect turkey or recreate your mom’s sweet potato casserole -- just remember, if all else fails, you can always buy something at Citarella, put it in a Tupperware, and lie through your teeth as you tell everyone you made it. Join Thrillist at our Artists & Fleas pop-up for three days of cocktails, snacks, chats, and crafts. Take a turn in the photo booth, stop by the beard grooming or hair styling bar, peruse wares from more than 40 vendors, and get those gifts wrapped all under one roof. Get Santa without the #sponcon with a visit to The Paley Center for Media. The museum, which holds a permanent collection of nearly 150k radio and TV shows, hosts a holiday party all month long -- and on weekends, Santa shows up. 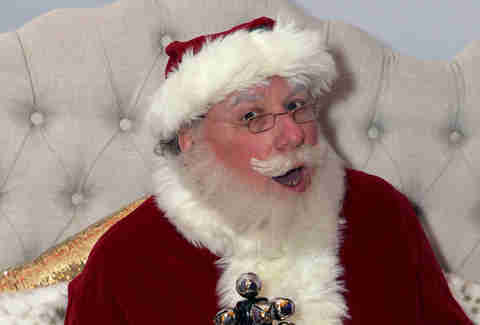 It’s a lot lower key (and lower budget) than Macy’s South Pole extravaganza, but Santa is Santa, right? Plus, they’ll be screening films from their archive, including Santa Claus Is Comin’ to Town and -- ahem, a personal favorite -- A Rugrats Chanukah. Drummers, dancers, singers, and musicians celebrate the longest night of the year with a modern take on an ancient solstice ceremony. Now in its 39th year, the performance has grown to fit the awe-inspiring space of the Cathedral of St. John the Divine, which is two football fields long and high enough to hold the Statue of Liberty. (For the solstice, it holds the world’s largest gong, instead). No matter what you believe, the celebration is an ecstatic way to welcome the sun back after a long, dark night. Join a pair of astronomers at the Hayden Planetarium as they walk you through the movements of the planets for the coming year at an after-hours planetarium show. With a series of meteor showers, a total lunar eclipse, and a rare transit of Mercury across the sun on the docket for next year, you can’t say nobody warned you. If 2018’s planetary madness was any indication, you’re going to want to stay woke in 2019. After you open your stockings and unwrap your presents, head to Mt. Olivet Baptist Church. 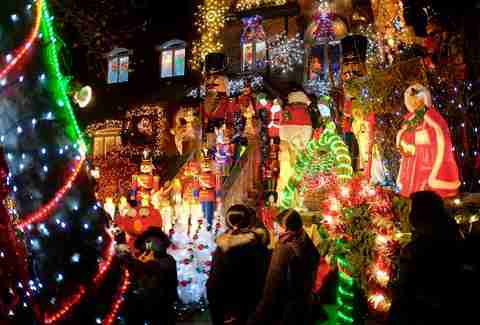 This prominent and influential Harlem institution hosts a gospel concert every year on the mornings of Christmas Eve and Christmas Day. Mt. Olivet is welcoming to all congregants, even those who aren’t regular churchgoers. Come prepared to clap, dance, and sing along as you celebrate the season surrounded by joy and love. Harlem-born choreographer, director, and educator Abdel Salaam brings his Forces of Nature dancers to celebrate community and Black culture through a combination of West African and contemporary dance at the famed Apollo Theater. This dynamic Kwanzaa performance has become a tradition for families in New York and beyond since 2006. 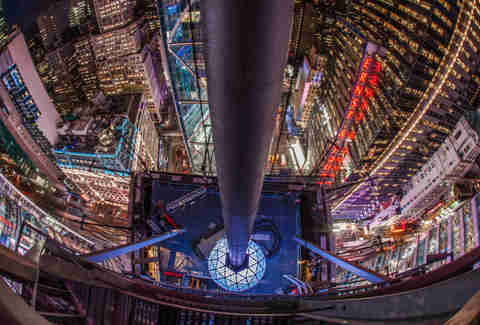 The first New Year’s Eve celebration in Times Square took place in 1904, coinciding with the opening of New York City’s very first subway system. Now the subway is broken and New York is over, but Times Square’s still got the biggest celebration in the city. Luckily, you don’t have to wear diapers all day, eschew booze, and get covered in confetti to watch the ball drop -- you can download the app and watch the livestream, instead. Or you could just go to sleep at 10:30 and tell yourself that 2019 has got to be better than this. If joining the Polar Bear Club is on your bucket list, it’s time to take the plunge. 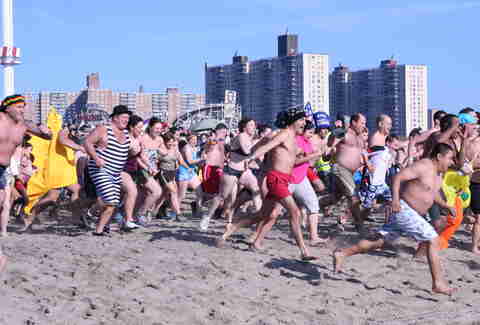 Every New Year’s day, hundreds of brave folks meet up on the Coney Island boardwalk to run full speed into the Atlantic Ocean while hundreds more watch nearby in disbelief. Sure, it’s a bracing way to start 2019, but what better way to kick off the new year than taking a risk, trusting yourself, and doing the thing that scares you?